I don’t know about you, but the dry, cold air hit us BAM quick this year. My skin is still in a panic, gasping out cries for moisture! please! Diligent hand washing and overuse of hand sanitizers are making my hands suffer the most. I’m quite sure you know what I’m talking about. It isn’t pretty and it sure doesn’t feel good. I have been using one particular hand cream for several years and I can’t find anything I like more. 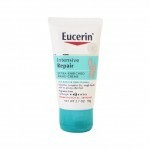 Eucerin Intensive Hand Repair. It has no fragrance and spreads evenly and easily. The key is alpha-hydroxy acids which gently exfoliate your skin and allow the moisturizers to penetrate and do their job. Your skin will be softer and less likely to crack and split. Your cuticles will thank you too.